On sale! 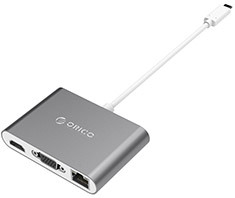 (normally $99) The Orico Type-C Aluminium Multi-Function Docking Station allows you to easily expand your I/O with USB 3.0, VGA, HDMI, Gigabit LAN and more. It supports two-way PD power transmission, allowing it charge a connected laptop while expanding the available interfaces and USB 3.0 technology ensures data transmission of up to 5Gbps.